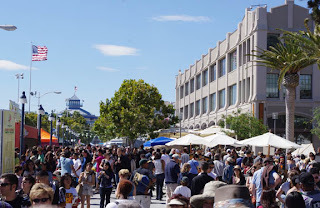 While this is the 2nd year of the Eat Real Festival, this was our first time visiting. It was a beautiful, albiet windy, day out at Jack London Square in Oakland, but it didn’t stop people from coming. OK, as a side note, if you’re planning a big event let me just say that if you want super high attendance you need to make it free or nearly free! Trust me, people are much more willing to spend money while they are there if they don’t have to pay to get in. The place was packed. We got there early afternoon right in time to see the presentation on goat butchering (don’t worry, the animal was already dead). I found it interesting to watch the three butchers from Avedano’s from San Francisco (located in the Holly Park Market) make quick work of the carcass. Dave the Butcher showed how to break down the carcass. I like how Avedano’s focuses on humanely raised grass fed animals from small farms rather than certified organic animals. Organic certification can be well out of the affordability of small farmers but it doesn’t make their product any less ethical. Dave also made a good point that organic does not mean grass fed nor does it mean humanely raised. Another highlight was watching Heidi and Ute’s presentation on Chickens 101. Some of you know Heidi who owns Itty Bitty Farm in the City. She gave a fantastic talk and answered tons of questions from the audience. That’s the one thing I loved about this festival. People were truly interested in changing their lives and they weren’t afraid to ask questions. We rounded out the awesome day with watching the Steer Butchery Contest. 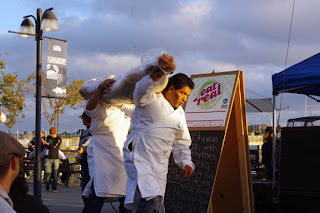 Three teams of two raced to break down a rear quarter of a grass fed steer. They were judged on not only speed, but amount of waste and the number of quality cuts. 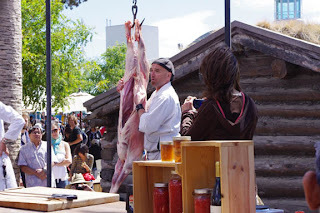 It was a fantastic day and I look forward to next year’s Eat Real Festival. Thanks for the shout out! It was super fun. I had loads of people asking me if it was my goat that they were going to butcher. I think folks confuse "slaughter" with "butcher". Two very different things. What a fabulous idea for a food festival. Not every day you hear of a Steer Butchery Contest! Clare, it really was a day of meat! Everywhere we looked there was more meat! OK, maybe not, but there was definitely an underlying meat theme.